Mobile consumption of sports content has doubled to 42 percent in the past three years. 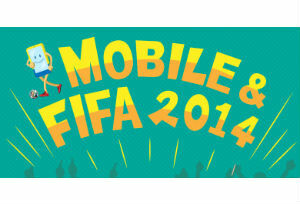 The 2014 World Cup is being hailed as the most social and mobile sporting event of all time. Google saw a 233 percent growth in soccer-related searches compared to last year and Twitter says the World Cup will be the most tweeted event ever. The Cup’s biggest brands such as Nike and Adidas have spent less on TV and more on digital advertising for this year’s games. The average U.S. consumer spends two hours and 42 minutes a day on mobile devices; 86 percent of that time is spent in apps. Advanced streaming technology and apps like Univision Deportes and ESPN let fans watch the games directly on their smart devices. Two out of three American soccer fans are expected to use their smartphone or tablet to enhance their World Cup experience. More than half of them will watch videos, event highlights and interviews on their smartphones. Check out the infographic below by mobstac.com to see how consumers are using their smart devices to follow the 2014 World Cup and for tips on how to engage them.